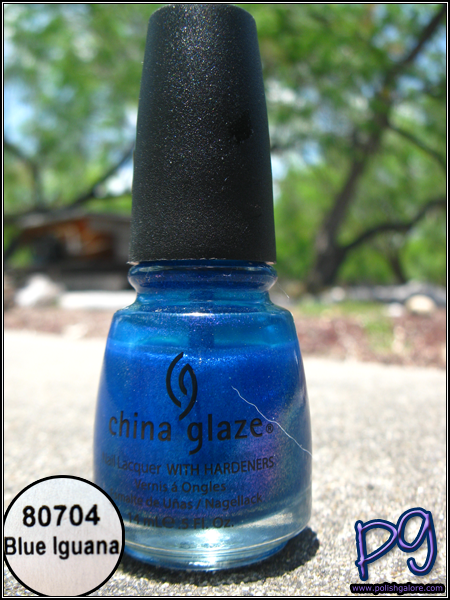 I used a base coat of Seche Natural, 3 coats of Blue Iguana and a top of Seche Vite. Here in the shade you can see how amazingly smooth this formula is, especially since it looks like it would be gritty with all that shimmer/glitter in it, but nope! It's super smooth, super shiny (super easy to apply and control). Indoors with the flash - you can really see how much polish is seriously missing out of my bottle. Oy. I almost wished I had bought a back up and might still. Ooh, bonus - check out the bottle in this picture. Do you see all that purple on the side?! This, 108 Degrees and Senorita Bonita are my hands down favorites of Island Escape. the last picture almost flashes green on the nail. i'm assuming that's not how it looks in real life, though :( beautiful color, anyway! this is one of my favs right now. 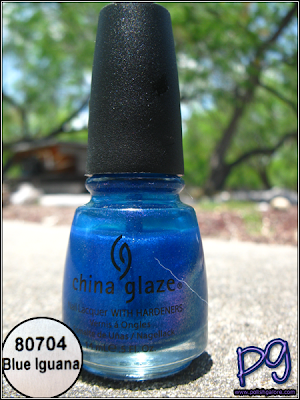 I read on glitta gloves blog to try one coat of blue iguana over black and I must say it is amazing.